and sing praises unto thy name. and pay your vows unto the most High. for that thy name is near thy wondrous works declare. of them rejoice that seek the Lord. who can shew forth all his praise? of the afflicted, and the right of the poor. We give thanks to God always. to the which also ye are called in one body; and be ye thankful. the Lord Jesus, giving thanks to God and the Father by him. which are out of place, but rather thanksgiving. has taken to thee thy great power, and has reigned. Notes on Quotes: A survey of The Complete Concordance to the Bible: New King James Version (Thomas Nelson Publishers, Nashville, 1983, pp. 967-968) shows that "gratitude" is not cited. However, we note the number of occurrences of the following words: Grateful 1, Thank 24, Thanked 3, Thankful 3, Thankfulness 1, Thanking 1, Thanks 75, Thanksgiving 31, Thanksgivings 2. Biblical quotes on the theme of gratitude were selected from this listing. Web links to the Internet Sacred Text Archive are provided to Bible verses cited. Notes on Images: King David by Marc Chagall appears on a multicolored postage stamp of Israel (Scott #399) issued on Sept. 24, 1969. Greece issued a set of four stamps (June 15, 1951) commemorating the 1900th anniversary of Saint Paul's visit to Athens. 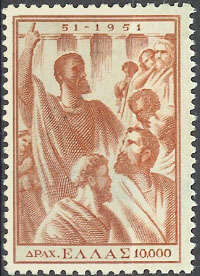 The 10,000 Drachmai red brown stamp depicted shows "Saint Paul preaching to the Athenians". 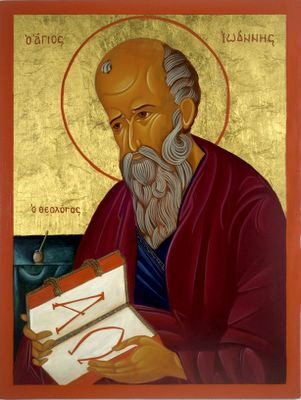 The icon of Saint John of Patmos was painted by Heather Williams Durka (2004). It was installed as Patronal Icon for St. John Episcopal Church of Olympia, WA.